When the professor of evolution called me into his office, I was apprehensive. He informed me that the faculty of zoology had been discussing my case, and that while they realized that it was my own business what I believed, it was their duty to see that they did not grant a PhD to someone who was not a scientist. He wanted to know about my belief in Creation. I told him that while I could see how one might follow an evolutionary pattern of thought, I had certain problems when I went down that pathway. I listed to him a number of scientific problems with evolution including the fact that no fossil evolutionary ancestors of the turtle have ever been found. The turtle is a very unique organism that would be expected to leave many intermediates as its systems gradually changed from an assumed lizard type of ancestor to a fully evolved turtle. Many thousands of fossil turtles have been found, one over 10 feet long, but the many evolutionary intermediates expected are notoriously absent. Did the turtle evolve, or was it created? The professor admitted to me that there were some problems with evolution, and seemed satisfied with my scientific approach. This incident well illustrates the ongoing battle being waged between science and the Bible. I was later informed that the only reason I was allowed to graduate was that the faculty of zoology, some 30 strong, could not agree as to what to do with me! I thank the Lord that I was able to complete my studies at a respected institution. The controversy between the Bible and science is one of the fiercest intellectual battles of all time. It has been especially intense during the past two centuries. The powerful scientific community strongly supports the concept that life gradually evolved by itself over billions of years. This stands in stark contrast to the Biblical model of a recent Creation of life on Earth, by God, a few thousand years ago, in only six days. The incongruity between the personal belief in God of many scientists and the general absence of God in scientific interpretations can probably best be explained on sociological grounds. The Adventist Church has had more than a passing interest in the discussion. We believe that the Bible is the Word of God and that God is the Creator. Our most distinctive doctrine, the seventh-day Sabbath, rests largely on the fact that God created in six days and rested on the seventh as recorded in Genesis. God Himself declared the seventh-day Sabbath during the ominous and dramatic events at Mount Sinai. There He spoke and wrote with His own finger the Ten Commandments.iii These are likely the most authoritative words from God that we have. In the Fourth Commandment, which is the longest of the Ten, God explains that He created in six days, and rested on the seventh day; and He commands us to follow His example. It is not easy to dismiss God’s plain statement that in six days He made heaven and earth and sea, and everything in them, and rested on the seventh day. This does not at all sound like the development of life over millions of years as proposed by science. The Three Angels’ Messages of Revelation 14, given as a warning for the last days of earth, provide further reason for Adventism’s interest in Creation. Part of the First Angel’s Message is an admonition to “worship him that made heaven and earth and the sea and the fountains of water” (Revelation 14:7). The message that God is Creator would seem to be particularly timely for the Adventist Church, since Adventism developed just as the intellectual community of the western world generally accepted evolution. Probably no other idea has had such a pervasive and secular influence on human thinking as evolution has. The date of 1844 is particularly meaningful to us since this is the time of the great disappointment that brought forth Adventism. But 1844 is also an important date in the history of evolution. That year there appeared in England a book entitled Vestiges of the Natural History of Creation. The title belies its heretical contents. The book caused a minor explosion in placid Victorian England.iv The author, after analyzing fossil patterns, proposed a then-shocking principle of progressive development for the life on Earth, that is, evolution. Adding to the intrigue was the fact that the name of the author was kept secret because he did not dare to identify himself. It was only revealed after his death in 1871. It turned out to be the well-known Robert Chambers, the editor of Chamber’s Encyclopedia. It has sometimes been proposed that it was no chance happenstance that the Seventh-day Adventist Church, with its special Sabbath based on Creation, came into existence at the same time as evolution. It has also been suggested that “God was not caught by surprise by this turn of events.”vi Could it be that one of the special purposes of Adventism is to counter the secularism brought on by the acceptance of evolution? While we don’t have strong evidence that the timing of the origin of Adventism was designed to coincide with the general acceptance of evolution, the idea is both intriguing and plausible. Regardless, there is no question that Adventism has an especially important message for the prevailing evolutionary philosophy of our time. Adventism with its seventh-day Sabbath that honors God’s six-day Creation week is a special answer to ideas of millions of years of gradual evolution where it is postulated that there is no need of a God. It is hard to separate Adventism from Creation. Even the first part of our name “Seventh-Day” refers to a memorial of the six-day Creation week. When Charles Darwin published his Origin of Species, it was greeted with a strong but mixed reaction. Some prominent biologists especially objected to his views. However within a few decades, evolution was generally accepted, especially among scientists, and eventually among many theologians. Of special interest was a noted group at Princeton University who opposed Darwin but adopted views, of which there are many now,vii that have played a prominent role in the debate. None of them agree with the Biblical model of a recent Creation by God in six days. These models are notably speculative, lacking any direct authentication from the data of nature or from the Bible. Progressive Creation is one of the intermediate views closer to the Biblical Creation account. It proposes that life developed over millions of years, as God from time to time created more and more advanced forms of life, eventually creating humans. Some advocates of this view propose that each day of the Creation week described in Genesis represents a very long period of time. However, the sequence of events in Genesis, where plants are created on the third day before animals on the fifth and sixth days, does not fit the order of the geologic layers where the major groups of animals appear before almost all the major groups of plants. Probably the most serious inconsistency this model faces is that we see the effects of sin in the fossil records at a time that this model assumes to be long before the Creation of humans, their fall, and the consequences of that fall on nature (see Genesis 3:14-19; Romans 5:12-19, 8:20-22). Genesis 1:31 tells us that what God creates is “very good.” How could that very good Creation explain dinosaurs chewing each other up over millions of years before the arrival of sin and its aftermath? Furthermore, many thousands of important groups of fossil plants and animals are not now living on Earth. Why would a kind and omniscient God create so many species over millions of years only to have them die out? The Biblical model of a recent Creation, the Fall of humankind, the consequences of sin on nature, and the subsequent destruction by the Genesis Flood, resolves these inconsistencies. Theistic evolution is another popular intermediate view between Creation and evolution. Here is God closely associated with a continuous evolutionary process over millions of years. He uses evolution, and He is there to help when evolution is inadequate. The model faces the same problems mentioned for progressive Creation. Also, the many thousands of missing fossil intermediates between major groups of organisms strongly suggest that evolution never occurred. Furthermore it would seem strange that a loving and omniscient God would use the crutch of evolution where only the fittest survive. The concern God has for His erring and wayward children does not fit at all with the harsh competition and survival of only the fittest, as proposed for the evolutionary process. The recent intelligent design movement is a new kind of approach that aims to point to the scientific evidence for some kind of designer. It studiously avoids any reference to the Bible and religion. While its contribution to the origins debate is significant, Adventism, which upholds the Bible as the word of God, adds a much richer input to the discussion. Intermediate views such as theistic evolution and progressive Creation have had a significant influence on religious beliefs. The mainline Christian churches have generally accepted such concepts. Evangelical churches that favor a more direct interpretation of Scripture tend to have reservations about such views in various ways. Church growth is a complicated thing, and this data does not warrant the firm conclusion that the trend towards evolution is necessarily the cause of loss in membership. But the trend is away from the Bible, and does not appear to have been helpful for either growth or the spread of the Gospel of salvation. In order to accommodate the Bible to a variety of other ideas about our origins, it is often suggested that the first eleven chapters of Genesis, which includes the accounts of Creation and the flood, are allegorical and not factual history. The problem with that interpretation is that the leading Biblical personalities do not treat the Creation and flood accounts as allegorical. Many, including Peter, Paul, Christ, and even Godx authenticate the factuality of Creation and the Flood. It would be a strange kind of God who would create over millions of years, and then ask us to keep the seventh-day Sabbath holy because He created all in six days! When the Creator of the universe makes a plain statement of fact, who are we to put a question mark after it? Drifting away from God’s words is a pattern that occurred frequently in Old Testament times. More recently, mainline churches have drifted away from their original beliefs in the Bible. In the last two centuries, many of the leading educational institutions in the United States such as Auburn University, Boston University, Brown, Dartmouth, Harvard, Princeton, Rutgers, the University of Southern California, Wesleyan University, Wichita State University, and Yale, which began as church-related religious institutions, have abandoned their religious foundations and become independent secular institutions. I do not know of any such institutions that began as secular and then became religious. The philosophy of education is now strongly secular. In some of these institutions we now find the leading evolutionary authorities of the world. Adventism needs to be especially careful that the pressures that have caused other churches and institutions to drift away from the Bible and God do not affect us. It could be argued that the trend towards evolution and secularization is a trend towards truth. Science has proved its value and we might as well follow it. However, this argument cannot be easily sustained. While some scientific interpretations challenge the Bible, the past two decades of scientific investigation have not been kind to evolution. 1. 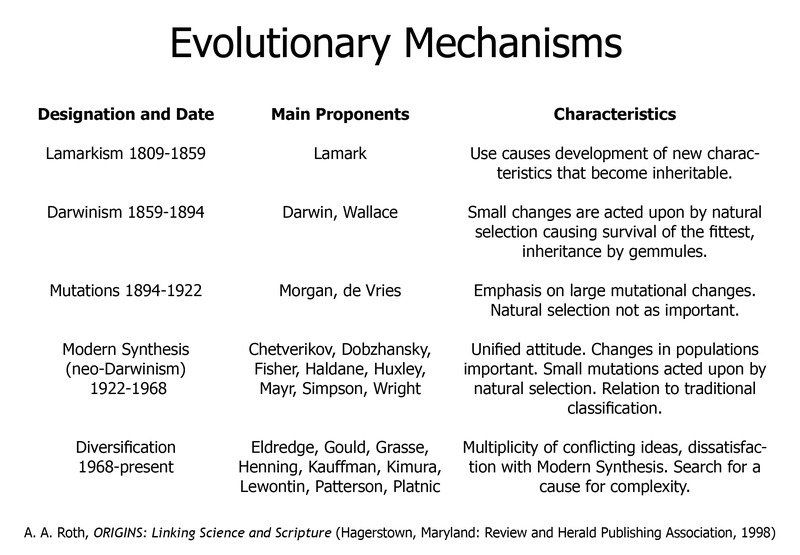 The recent discoveries in molecular biology present complexities of integrated and feedback mechanisms that thwart any idea that these could have just happened by chance.xi Thus far evolutionists have not been able to produce a workable model for the development of complexity (see chart). It appears that there has to be an intelligent mind behind all this. 2. A number of physical constants related to matter and the universe are exactly what they should be to make the universe habitable for life. Even every slight deviation could spell cosmic annihilation.xii This is very precise design. Adventism has a special opportunity here. We believe that the Bible is the Word of God. We believe that God is our Creator and that He has the ability to recreate us at the resurrection. We have a seventh-day Sabbath that witnesses to our belief in Creation. The opportunities before us are unprecedented. The world needs to know that the Bible is the Word of God and that God is the Creator. Our message provides healing for the skepticism, relativism, agnosticism, and nihilism that is so prevalent now. Above all, the world needs to know about the faithful and forgiving God of the Bible that is doing all possible for the salvation of all. i Online Gallup report and other reports of the Gallup Organization. ii E. J. Larson, “Scientists Are Still Keeping the Faith” Nature 386 (1997): 435-436.
iii Genesis 1, 2; Exodus 19-20, 31-32; Deuteronomy 5. Some point out that a six-day Creation is not mentioned in the Deuteronomy 5 version of the Ten Commandments. The Deuteronomy 5 account is Moses speaking to Israel. We are considering here the Ten Commandments spoken and written by God. iv E. Mayr, The Growth of Biological Thought: Diversity, Evolution, and Inheritance (Cambridge, Massachusetts: The Belknap Press of Harvard University Press, 1982): 382.
vi R. H. Pierson, “It Was No Happenstance,” Advent Review and Sabbath Herald 150 (May 10 1973): 2.
vii For a review of the main ideas and references see chapter 21 of A. A. Roth, ORIGINS: Linking Science and Scripture (Hagerstown, Maryland: Review and Herald Publishing Association, 1998). viii A. A. Roth, ORIGINS: Linking Science and Scripture (Hagerstown, Maryland: Review and Herald Publishing Association, 1998): 204-205. J. T. Baldwin, "The Geologic Column and Calvary,” Creation, Catastrophe, and Calvary (Hagerstown, Maryland: Review and Herald Publishing Association, 2000): 108-123.
ix D. M. Kelly, Why Conservative Churches are Growing: A study in Sociology of Religion (San Francisco, New York, and Hagerstown, Maryland: Harper Row, 1972). x See Exodus 20:11, 31:17; Isaiah 54:9; Matthew 19:4-6; 24:37-38; Mark 10:6; Luke 17:26-27; Romans 5:12-14; 1 Corinthians 11:8; 15:22, 45; 1 Timothy 2:13-14; Hebrews 11: 4-7; 1 Peter 3:20; 2 Peter 2:5.
xi L. M. Spetner, Not by Chance (Brooklyn, New York: The Judaica Press, Inc., 1996, 1997). M. J. Behe, Darwin’s Black Box: The Biochemical Challenge to Evolution (New York: Touchstone, 1996). xii D. L. Overman, A Case Against Accident and Self-Organization (Lanham, Maryland: Rowman & Littlefield Publishers, Inc., 1997). xiii E. Kauffman, as quoted in R. Lewin, “Extinctions and the History of Life,” Science 221 (1983): 935-937.
xiv A. A. Roth, ORIGINS: Linking Science and Scripture (Hagerstown, Maryland: Review and Herald Publishing Association, 1998).